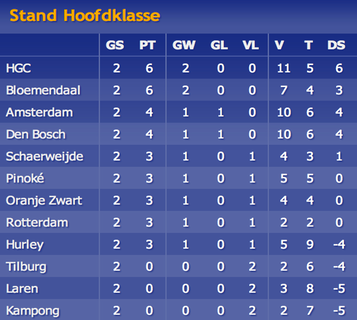 After our 5-1 win over Laren and thrilling 5-5 draw with Amsterdam we are sitting in 4th place. Below you can see how everyone else is fairing after two weeks. This coming weekend we have a double header against Kampong and Rotterdam. Kampong who are suffering from a number of injuries are never easy but perhaps this is an opportunity for us to get one over them, something which we haven't done for some time. 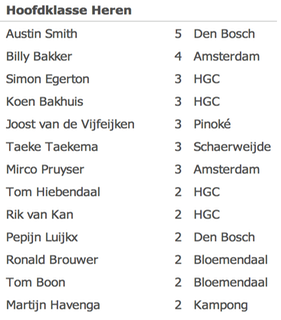 I've had an incredible start from a goal scoring point of view, you can see the leading goals scorers list below as well. The first time I have ever been at the top of that table. Let's see how long I can remain there!